A fire has broken out at a secondary school in Cambridgeshire. Cambridgeshire Fire Service said the blaze was reported in the single storey public library at Sawston Village College at 14:15 BST. Police have confirmed that all staff and students were safely evacuated from the school, south of Cambridge. The blaze was tackled by eight crews from Sawston, Cambridge, Saffron Walden, Royston, Huntingdon and Newmarket. The fire was in the oldest part of the school and affected the whole building, a fire service spokesman said. Eyewitness Olly Capes, who lives opposite the school, said: "I heard all the commotion with fire engines then saw smoke billowing from the oldest part of the college. "You could see the fire was about 25ft up in the air and I believe that maybe the library had collapsed as well. "But it seems to be more under control now, and the police are just sorting out all the children because obviously it's the end of the day so lots of parents have arrived as well." Maurice Moore, area commander for the fire service, said: "Firefighters worked extremely hard to put in fire breaks at either end of the library and stopped the fire from spreading." 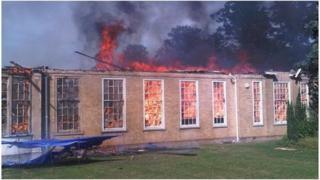 The fire service said the blaze was under control by 16:00 and crews were due to leave the school by 17:00 BST. An investigation into the cause of the fire will be carried out on Friday, but it is not believed to be deliberate. Cambridgeshire County Council said the college would be closed to pupils on Friday.